The Play For Prevention program focuses on education, awareness and the promotion of active and healthy living. Hayley Wickenheiser, arguably the best female hockey player ever, continues to support a diabetes prevention program for Indigenous youth. Wickenheiser, 39, retired earlier this year following a 23-year career with the Canadian national women’s hockey team. She was in Toronto on Thursday morning for a news conference announcing that Sun Life Financial is pledging $450,000 in support for Right To Play’s Play For Prevention program. This program began in 2010 in a pair of northern Ontario First Nation communities, the Moose Cree First Nation and the Sandy Lake First Nation. It has now spread to 75 Indigenous communities and an additional 15 urban organizations across Canada. Programs are run in Ontario, Alberta, British Columbia and Manitoba. Thursday’s event was held at the First Nations School of Toronto. About 20 elementary-aged students from the school attended the news conference and also displayed some of the active games they play. Wickenheiser, who won five Olympic medals (four gold and one silver) during her career, has been an athlete ambassador for the Right To Play movement since it was founded in 2000. The program allows children in need to play various games. Besides her long-time Right To Play involvement with Right To Play, Wickenheiser revealed she has an extra special personal connection to the Play For Prevention program. More than a decade ago her father Tom was diagnosed as having diabetes. But he altered his lifestyle to a more active one while eating healthier. Wickenheiser believes the fact she has a personal connection to the disease will assist in her message when she discusses the Play For Prevention program with Indigenous youth. “No one is immune to this,” she said. Wickenheiser, who is now attending medical school at the University of Calgary, believes all youth, and not just Indigenous ones, should have diabetes prevention awareness programs. 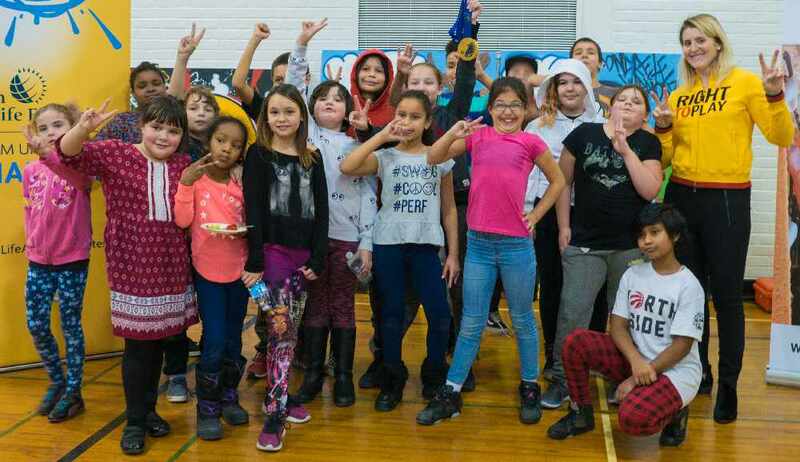 “The message is it should be available to every child,” said Wickenheiser, who brought along her gold medal from the 2014 Sochi Olympics in Russia on Thursday to show the youngsters in attendance. Wickenheiser also had a message for the youth who attended the news conference in their school. “You guys are the future of Canada,” said Wickenheiser, who also captured 13 medals (seven gold and six silver) from the world women’s hockey championships during her playing career. Lori Smith, the national director of Right To Play Canada, was thrilled to have Wickenheiser, the most recognizable Right To Play athlete ambassador, at Thursday’s news conference. Smith was also excited that Sun Life Financial will continue to support the Play For Prevention program. “We literally can’t do our work without groups like Sun Life and other philanthropists,” she said. There’s a good reason why the Play For Prevention program is geared toward Indigenous communities. In 2011, a study by the Public Health Agency of Canada showed alarmingly high rates of diabetes in Canada’s Indigenous population. The study also showed the onset of the disease occurs in much younger people in Indigenous communities. Sun Life Financial began its financial commitment to the program in 2015. Its initial pledge that year was $150,000. “They’ve been tremendously impactful,” Smith said. Smith believes the program will continue to grow now that Sun Life Financial has chipped in considerably more money. Lisa Ritchie, the Sun Life Financial senior vice-president and chief marketing officer, said there is a simple reason why her company is involved with the Play For Prevention program. “Diabetes is an issue and it has reached epidemic proportions,” she said. Ritchie has seen how the funds her company has pledged has benefitted the program. “We’ve seen the positive effect it has had,” Ritchie said, explaining why Sun Life Financial will not only continue to offer, but also increase its financial support. The impact that the contributions made by Sun Life Financial has had was evident during a short video that was shown on Thursday. The four-minute video focused on the diabetes prevention program in Sioux Lookout, Ont. Watch the video here: https://sunlife.hubs.vidyard.com/watch/xT4g86uwUQMUBHzmpuMBey?